If you are not completely happy with your Mix, choose Stem-Mastering. Send up to 4 Stems/Tracks for each Song, I enhance your Mix by tweaking each stem detail individually and Master your Song. So I have more control on every sound element and can fix your mixing problems even more. You get a clear and warm result to have optimized sound on streaming services or download shops. As addition you also get a Native Instruments STEMS file, to let your song get remixed or played live on Traktor compatible devices. The Pro Stem Mastering includes 3 different versions. 1 Mastered Native Instruments STEMS File: A audio file that contains a track split into four musical elements like A drums STEM, a bassline STEM, a harmony STEM, and a lead STEM for example. What is a Stem Mastering? Stem Mastering is the best option to improve your Mix, because it's an Mastering technique with more depth and fine tuning options. You send up to 4 Stems / Tracks of grouped instruments such as Drums, Bass, Synth or Vocals. Al these grouped Stems (also known as submixes, subgroups, or busses) get edited separately. By smooth mixing these 4 Stems with EQing, dynamic compression and loudness adjustment your song is routed through our regular Mastering chain. We improve your mix and bring your music to the next level by adding punch and power to the bass. Your Song will sound more balanced and airy in the highs by using our top notch mastering processors. In the end you will hear a warm analog character in all your song elements. The Stem Mastering can be optimized for streaming, CD, download, club sound systems, vinyl or tape. Order this service if you wanna have a in-depth mastering for your music to enhance the sound quality and get a professional sound. The less compromise you can make in the mastering process, the better the result. Let's say you have a great mix, but which has too little bass instrument, too much kick, and the lower midrange is a little bit muddy. This is a potentially bad combination for mastering. However, in situations like the aforementioned, when time is tight, I would ask the client for a stem mastering, and the results have always been better than if I had mastered from a stereo file. 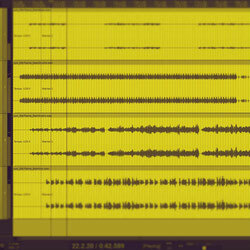 With 3 to 6 stereo stems(Instrument Tracks), I can get great results mixing and mastering at the same time. The result produces results with the least compromise. For example, the mastering processing is going to affect the clarity of the midrange and through "slop" will probably leak down into the bass region, hopefully for the better. But in the case the mastering processing could easily make one range better while making the other worse. If mixing with the mastering processing in place, I have it all in context at one time in the ideal acoustic of the mastering room. I think mixing from stems while mastering can produce the very best product. How to prepare and send Stem Files for Mastering? Split and bounce your Song in 4 musical elements such as Drums, Bass, Vocals, Synth or organic Instruments. You can do that by deactivating some mixer tracks and bounce and render just a part of your song. Send these Files as 24 Bit or 32 Bit .wav files with a sampling rate of 44.1khz by using wetransfer, google drive or dropbox. If you have a question click this Link to use our contact form. How to render Stems with your DAW? What is a Stems File? A MP4 STEMS file is a open multi track audio format by native instruments. A file contains your songs split into four musical elements, like a drum STEM, bassline STEM, synth STEM and a Vocal STEM. When you order a Stem Mastering here at mastrng.com, you get a regular stereo .wav file and the NI STEMS file. These Stem file can be used by DJs and Live artists for mixing and remixing with TRAKTOR KONTROL S4, S8, S5, D2 or F1. To get the best possible sound out of your music, every STEMS track will be mastered through the same mastering chain that is used on the master track.